Any discussion of safety with respect to a laser materials processing system should be prefaced by stating that laser systems must be monitored at all times by an attentive and well-trained operator. Failure to observe this practice poses the single largest safety hazard to the laser system, the facility in which it operates, and nearby personnel. ULS laser cutting, engraving, and marking machines are specifically designed to comply with Center for the Devices of Radiological Health (CDRH) division of the Food and Drug Administration (FDA) under 21 CFR 1040.10 and 1040.11 and to comply with European laser safety regulations under EN60825-1. 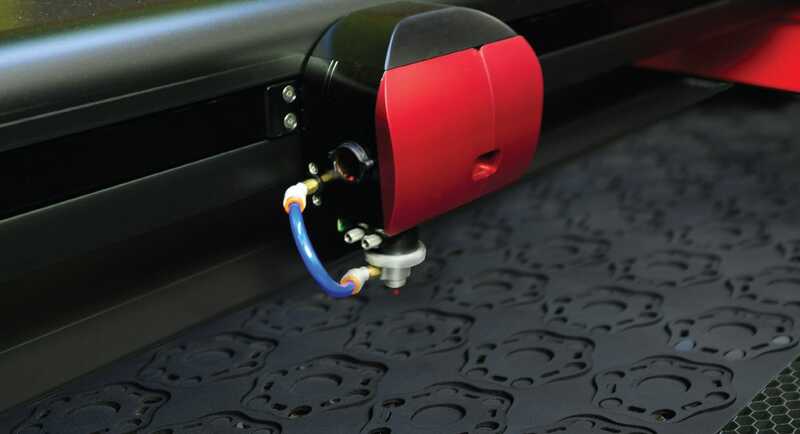 In addition to operator attentiveness and training, there are a multitude of safety considerations which must be made when purchasing laser cutting, engraving, and marking equipment. Broadly speaking, they can be classified as: Direct Laser Energy Exposure Considerations, Fire Considerations, Exhaust Considerations, and Electrical Considerations. Laser safety standards are well established and relatively harmonized internationally. The two most prevalent versions of these harmonized laser safety standards are 21 CFR 1040.10 and 1040.11 in the US and EN60825-1 in Europe. These harmonized standards establish four broad classifications of laser safety for products. The classifications range from Class 1 in which the laser energy is fully contained within the laser system and the operator is not exposed to any laser energy, to Class 4 in which the laser system does not have containment provisions and the operator can potentially be exposed to high levels of laser energy. To process materials in a Class 1 laser system, the material must fit completely within the laser system enclosure. All ULS laser cutting, engraving, and marking machines are designed to meet Class 1 safety requirements for material processing laser(s) meaning they are designed to fully contain all laser energy used for material processing. To do this, ULS platforms employ laser hardened enclosures, along with labyrinth seals and redundant hardware interlocks on all doors and access panels. Class 1 laser products are considered safe for use by the general public as long as all safety precautions are followed as outlined in the manuals. There are no restrictions on the sales of Class 1 laser products. No safety gear or special facility accommodations are needed to operate a Class 1 laser system. All ULS laser systems are also equipped with a low power red diode laser for aligning materials to be processed by the material processing lasers. The red diode lasers are similar to the laser pointers used in presentations and are considered safe for public use. ULS laser systems are labeled as Class 2 laser systems due to the presence of the red diode laser for alignment but meet Class 1 requirement for material processing laser(s). Some ULS laser systems (ILS and XLS) can also be operated in Class 4 mode in order to process materials that are too large to fit completely within the laser system when equipped with an optional Class 4 Conversion Module. This module bypasses the interlocks on the side doors to these laser systems and adds additional safety features required only on Class 4 laser systems, such a key switch to prevent unauthorized use of the laser system, an emissions indicator to warn when the laser is active, and a mechanical shutter to block laser energy from entering the material processing area. Operation of the laser cutting, engraving, and marking machine in Class 4 mode puts additional restrictions on the operators and owner of the laser system including the requirement for a trained laser safety operator, laser safety gear for the operators to wear, and the designation of a restricted area for the laser system to operate in. Many of these safety measures are outlined in ANSI Standard Z136.1 “American National Standard for the Safe Use of Lasers” or in equivalent standards available in most other countries, such as the European Standard EN 60825-11. Other safety measures may be required by state and/or local authorities, for example, the Regulation BGV B2 on laser beams of the German Employer’s Liability Insurance Association. It is the responsibility of the Owner of a Class 4 laser system to understand and adhere to these laws. Under certain adverse conditions, materials being laser processed have the potential to ignite and continue to burn which can cause damage to the laser material processing equipment along with surrounding property. This can create potential safety hazards for nearby personnel. ULS laser cutting, engraving, and marking machines address this issue in several ways. All ULS system enclosures are made from steel, aluminum, and laminated safety glass. All of these materials will not ignite at high temperatures and are designed to contain fires occurring within the enclosure. Use of fire-safe materials is not common amongst all laser system manufacturers. Several companies use combustible materials both within the enclosure and for the enclosure itself. This arrangement increases the likelihood of fire and prevent containment. The primary method for preventing combustion and subsequent fire when processing materials with a laser is constant operator supervision of laser material processing. As a backup to supervision, ULS has developed a fire suppression option available on XLS laser systems that can help mitigate the potential for damage to the laser system and its surroundings. The fire suppression module will deploy fire suppressant into the laser material processing area if self-sustained combustion is detected. (See white paper on fire suppression option for more details). Laser material processing produces byproduct comprised of particulates (smoke) and volatile organic compounds or VOC’s (fumes) that must be removed from the material processing area of a laser system and handled in a safe and appropriate manner. It is best practice to filter the byproducts from the exhaust air stream before venting to the outside whenever possible. ULS provides a line of air filtration solutions appropriately sized for each laser system. These air filtration solutions contain patented technology to improve performance and safety. Learn more about UAC air filtration units. ULS laser systems are designed to meet internationally recognized and harmonized safety standards for information technology equipment UL/EN60895. One of the primary concerns of this general safety standard is electrical safety. ULS laser sources are all air cooled and powered by low voltage RF power supplies. By contrast some other laser system manufacturers use water cooled glass laser tubes powered by high voltage DC. Water and high voltage electronics always present a safety hazard when either system does not function properly, for instance in the case of a water leak. Power supplies for glass tube lasers have operating voltages in excess of 25,000V and are always remotely connected to their power source through high voltage cables and connectors, presenting a lethal electrical shock hazard. In addition, the power supplies used to power glass tube laser sources operate in an electrical current range (30 to 150 mA) that is particularly dangerous to the human heart causing defibrillation and death. This technology requires these high voltages to ionize the gasses within the laser tube. Due to the many safety concerns regarding the use of these glass tube lasers, ULS highly discourages potential users from considering the purchase of laser processing system built with high voltage glass lasers. Learn more about important laser material processing considerations.